With its network of more than 32,000 clubs worldwide, Rotary is uniquely effective in helping communities recover after a disaster. Because all Rotarians are part of a community, members can quickly identify project opportunities when a local disaster occurs. 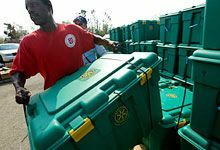 When disaster strikes, an immediate emergency response is necessary, but individuals, clubs, and districts should also consider how they can provide long-term assistance. After immediate needs have been met, long-term recovery projects are posted in the Projects database.